Please help make the State Tournament a safe and enjoyable experience for everyone! 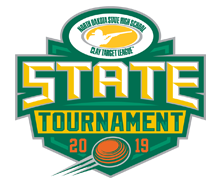 In order of importance, the three priorities of the North Dakota State High School Clay Target League are safety, fun and marksmanship. All participants and spectators are required to adhere to all event rules and requirements included in the League’s policies and procedures. Any participant or attendee who does not adhere to these rules will be disqualified and/or asked to leave the event. The event committee reserves the right to make alterations in, or amendments to these rules at any time without notice. All student athletes, teams and spectators are invited to the State Tournament. For more information about eligibility and registration, click here. 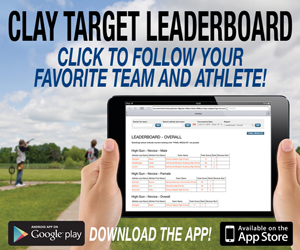 Student athletes shoot their assigned number of targets to compete in BOTH individual and team events. Student athlete classifications are determined by the athlete’s year-end average weekly score after Week 5. Team events for each classification (Novice, Junior Varsity and Varsity) require a minimum of five athletes in the same classification. Competition targets are included with the participation fee. All athletes will shoot 100 targets. All athletes are responsible for providing their own ammunition, which must adhere to gun club policies. Please contact the host club for questions regarding ammunition. Voice-released targets will be used on all fields where applicable. A minimum of five athletes from the same team in the designated classification will compete. There is no maximum amount of team members in a classification. The top five student athlete scores from a team will be used to determine the overall team score for their designated classification. No squadding is required. If a tiebreaker is required for any places, the team member with the highest round score from each team will be used to break the tie. Subsequent score comparisons will be used if the top score is tied. Teams must supply their own scorekeeper and Range Safety Officer (RSO). More details can be found below in the ‘RSO’ and ‘Scoring’ sections. It is highly preferred that no person act in more than one official role (Coach, RSO, scorer) at any time. A coach should not act as a coach and RSO at the same time, or an RSO should not also act as scorer, etc, at the same time. Student athletes should place additional box of shells on the 24-yard line, for easy accessibility after rounds are completed. Squads cannot take a break between rounds except to retrieve the second box of ammunition.. Squads must be prepared to shoot immediately after the previous squad completes their round. Scoring disputes must be initiated by the student athlete only, and must be immediately after a scorer announces a lost target. Please reference page 9 of the Official League Policies and Procedures regarding disputing targets. Coaching is not allowed while athletes are shooting. Coaches may not be on the field while athletes are shooting. Coaches must remain on the sidewalk (if applicable) or a minimum of 5 yards behind the scorekeeper. Coaches may not communicate with scorers during shooting. Coaches may aid special-needs student athletes that require assistance while shooting. Scoresheets must be submitted to scoring officials immediately after a round is complete. Lost scoresheets will result in a zero (0) for the entire squad. Due to high participation levels, practice rounds may or may not be available, based on the host club’s staffing and field availability. In the event of inclement weather before or during the Tournament, the League will make safety the first priority. When lightning is observed or thunder is heard, the event must be suspended. The occurrence of lightning or thunder is not subject to interpretation or discussion. Lightning is lightning; thunder is thunder. Everyone will be asked to take shelter either inside of a building, shelter or vehicle. If, after lightning is seen, and it does not reoccur for 30 minutes, the event committee will review weather reports and the committee will decide if/or when the competition will resume. If severe weather is forecast, and time permits, all participants will shoot a lesser number of targets as determined by the event committee. If time permits, all participants will shoot more targets until the prescribed number of targets has been shot. If weather does not permit completion of the shooting, the team with the highest score of the round(s) every shooter was able to complete, will be deemed the winner of that competition. Coaches are required to check-in at the registration tables located in the clubhouse. Coaches will receive athlete event t-shirts for their entire team. 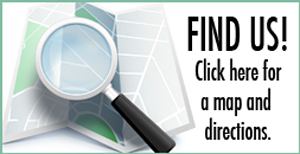 Athletes need to check-in with their coaches near their assigned field(s) before their assigned times. Athletes DO NOT need to check-in with event staff. As there are many similar shotguns at events. To avoid lost or misplaced shotguns, the League strongly suggests that student athletes affix a label that includes the name, school team, and contact information to their shotgun. Specific time and field assignments for teams are posted on the website and throughout the shooting facility during the event. Athletes will only be able to shoot during their team’s scheduled time on their team’s designated field(s). It is possible that final remaining members of team may be combined with another partial team to create a full squad of participants to maximize time allotment. Teams should arrive at least one hour before their scheduled time to allow check-in, squadding, and setup. Teams will shoot in two separate sessions. After the starting time for each day, all starting and completion times are estimated. It is important to be prepared to shoot immediately after the previous team completes their round. No athlete registrations or substitutions are allowed at the event. Apply Session 1 labels on the score sheets for each preferred squad. Do not pre-squad Session 2 until Session 1 pre-squadding is completed. If a team has a short squad (less than 5), coordinate with an adjoining field/team to add student athletes to complete a squad. Novice, Junior Varsity, and Varsity shooters may be sqaudded together. Members from a different team CAN be included on the same score sheet. If a student athlete does not report to the assigned trap by the scheduled time, the student athlete must be moved to the final squad out. The League’s first priority is Safety. Each team will provide a Range Safety Officer for the event. Team RSOs are responsible for ensuring that athletes and teams safely follow all policies and procedures. In addition, Team RSOs will ensure that athletes and teams shoot at their scheduled time and field in a timely manner. The host club will have Master Range Safety Officers (RSOs) at the event to oversee athlete and spectator safety. Everyone is expected to comply to all instructions of all RSOs. In the event of a safety issue, Teams RSOs are to take action to correct any safety concerns and notify a Master RSO. Master RSOs have final say in all safety matters. Teams are responsible to bring a scorer for the event. Scorers must follow the scoring directions found at the top of each scoresheet. Failure to adhere to scoring instructions may result in score adjustments by event staff. Event staff scoring decisions are final. Scores are recorded on the pre-squadded scoring sheet and tallied in the clubhouse. 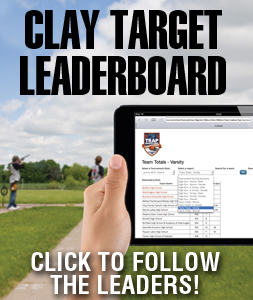 Scores will be posted on monitors if available and on the Clay Target Leaderboard available to most digital mobile devices. Scores are recounted by event officials to ensure accuracy. Mismarked or illegible scoring sheets are considered a ‘lost target’ by event staff. The only time a round score may be disputed is on the field immediately after a scorer has announced a lost target. All scores are final upon completion of the post. An award ceremony will be held at the completion of the competition. Awards for season competition will be handed out along with awards for event competition. If teams and/or student athletes cannot attend the event award ceremony, please pickup the award prior to departure or arrange a pickup of the award from event award officials. Team – 1st, 2nd and 3rd place. Any and all spectators are welcomed to attend the event. Team setups including tents and chairs are allowed BEHIND the field sidewalk. If permitted by the host club, vehicles are temporary allowed to drive to the spectator and assigned field area prior to competition to unload gear. The area in front of the spectator sidewalk must remain clear at all times for event officials and maintenance vehicles. There is no cost for spectators and parking is free. Food and non-alchoholic beverages can be brought to the event or purchased on event grounds and consumed in spectator or camping areas. Grills are not allow on The Shooting Park grounds. Friendly, obedient and socialized pets are permitted at the event. Pet owners who bring their pet is at their own risk and agree to accept full responsibility for any physical damage or personal injury caused by the owner’s pet or to the pet while on event property. Pets brought to the event must be current on all vaccines and must be able to provide proof of a current rabies vaccination upon request. Flexi-leads are not permitted. At all times, pets must be kept on a 6′ or shorter leash while on event property. As a responsible pet owner, please clean up after your pet. For safety reasons, the owner of any pet showing aggression or disruptive behavior may be asked at any time to remove the animal from the event. Please refrain from the use of tobacco on event property during event hours. Alcohol consumption is not allowed by any athlete, coach, parent, or spectator at any time during the event or awards ceremony. Credentials are for use solely in connection with news and editorial coverage of the event. Any non-editorial, commercial, or other unauthorized use of transmission, film, picture, videotape, audiotape, writing, drawing or other depiction or description of any participant, event, event information, standings, or other activity, is prohibited without prior specific written approval of the USAHSCTL. Any non-editorial or commercial use of any team school name or logo is prohibited without prior specific written approval of the USAHSCTL and the School Administration. Working credentials are not transferable, and may be revoked at any time at the sole discretion of the USAHSCTL, and will automatically terminate if any term hereof is breached. Organizations should contact the League at info@usaclaytarget.com to arrange credentials for League events. The event committee reserves the right to make alterations in, or amendments to these rules at any time without notice. The event committee consists of the League representative, gun club manager, and club-designated RSO.